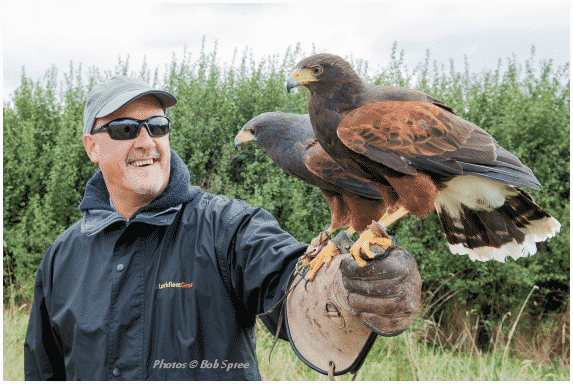 Bird of Prey Experience Day – Your Gift Problem Solved. Bird of Prey Experience Day, Up Close Personal Encounters with amazing birds of prey that will delight and amaze your special person. I guarantee they will have a great time. My customer comments say it all. My bird of prey experience day give lots of handling and up close time with the birds. I have small groups of up to six participants (20-30 are not uncommon elsewhere). I concentrate on being with the birds. With you doing the handling, flying and feeding and finding out all those special fascinating facts. 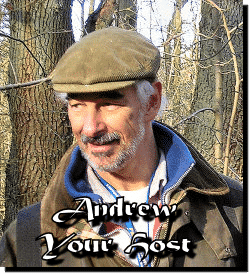 I like lots of questions and delve into my 45 years of falconry experience to answer them. I have a great location here in the countryside, marvellous birds and a generous welcome. This is A Gift As Special As They Are. 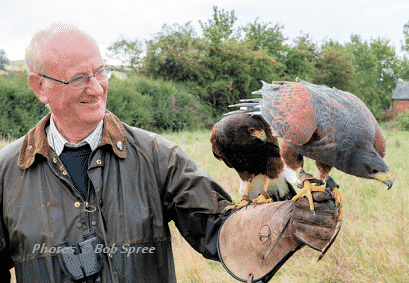 Select from a range of great bird of prey experience days in our online store. Or read on for more details of our great days out. Experience the Sport of Kings and the romantic association that has been held for centuries between mankind and birds of prey. A Bird on the Hand Gift Voucher (most are valid 12 months) is something you can be confident will be a great gift. A birds of prey experience day, what more could anyone want? 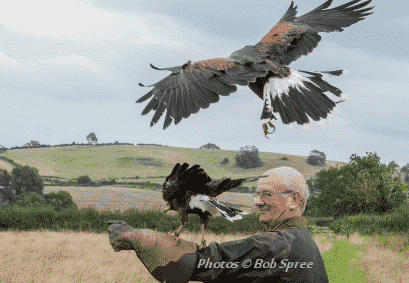 Birds of prey experience days gift vouchers can be personalised with your own greeting. They come in a lustrous gold wallet envelope with details and instructions for the experience. There is an option of a Deluxe pack where the voucher comes in dark green presentation box with all the details plus a miniature hand made leather falconers gauntlet as a key fob with a falcon's bell attached. It is completed with a gold bow for the box. The recipient can book a date to suit when they are ready and they can also upgrade to an alternative birds of prey experience day by paying the difference in price. Select from a range of great birds of prey experience days in our online store.